My love affair with French Lick began all very innocently. At first the mere mention of the of this rural Indiana city made me giggle; after all, it does sound a tad bit naughty. But then when a colleague described the beautiful old hotel that had accessible rooms and even a pool lift, my interest was piqued. The deal was sealed when I heard about a local zip line operator who went the extra mile to accommodate a wheelchair-user. That settled it, a visit to French Lick was definitely in my future. And once I got there, I was totally smitten. Located about a two-hour drive south of Indianapolis, French Lick has always been know for its healing therapeutic waters. The city takes its name from the French traders who founded it, and from the nearby salt lick that attracted scores of buffalo. In 1845 Dr. William Bowles opened the French Lick Springs Hotel, and guests came to take the waters. In 1855 Lee W. Sinclair followed suit and opened the Mile Lick Hotel nearby; which was later renamed the West Baden Springs Hotel, after the grand European spa. It was a good time for French Lick, as this resort town was in full boom mode. In 1901 a fire destroyed the West Baden Springs Hotel but Mr. Sinclair wouldn’t let that kill his dream. He vowed to rebuild his property in grand fashion, and in 1902 it reopened and became a top vacation pick of the rich and famous. Sadly that all ended with the depression. After that both properties changed hands many times and eventually fell into disrepair. Finally in 1994 the properties were purchased by an investment group; and shortly thereafter they underwent a multimillion dollar renovation. And the good news is, not only were they restored to their former glory, but they also had updated access features added. 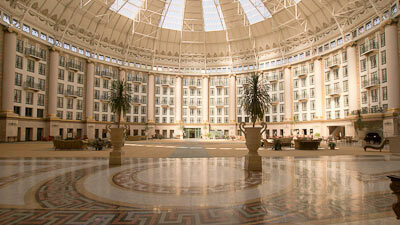 The French Lick Springs Hotel reopened in 2006, and the West Baden Springs Hotel welcome guests again in 2007. Today the properties boast a wide variety of restaurants, luxurious spas, a shopping arcade and even a casino. Indeed, French Lick is once again in the boom mode. Just walking inside the West Baden Springs Hotel (888-936-9360, frenchlick.com/hotels/westbaden/) is an experience in itself. Patterned after the grand spas of Europe, it features a magnificent 200-foot dome, with six tiers of guest rooms towering over the lobby atrium. Elegantly decorated, it simply exudes bliss; so much so, that I actually felt my heart rate lower as I crossed the threshold. You just can’t help but relax here. Access hasn’t been overlooked in this 234-room National Historic Landmark either; with level access to the front entrance, barrier-free access throughout the atrium, and elevator access to all floors. Room 4231 is a typical accessible room, which boasts lever handles, a lowered peephole, wide doorways and good pathway access. It’s furnished with a 27-inch high queen-sized bed. Access features in the bathroom include a roll-under sink, toilet grab bars on the back and left walls (as seated) and a low-step shower with a hand-held showerhead, grab bars and a fold-down shower bench. 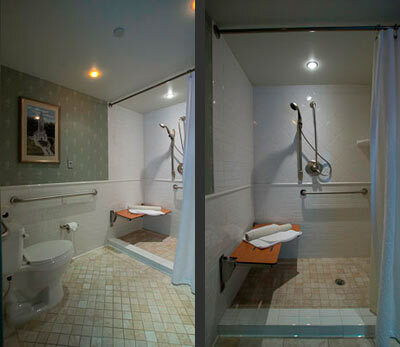 Although it’s technically not a roll-in shower, it’s still quite usable because of the shower bench placement. In fact, it’s possible to transfer to the shower bench without actually rolling into the shower. The six-inch step keeps the bathroom from flooding, while the placement of the shower bench allows for transfers from outside the shower. The public areas of the hotel are equally accessible, including the spa and pools. There is barrier-free access to the spa which features locker rooms with roll-in showers and accessible toilets with grab bars. 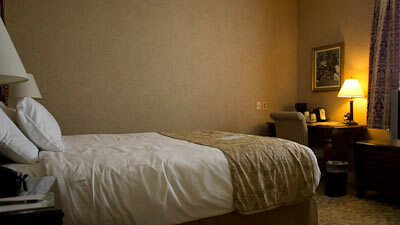 Additionally, the massage tables can be lowered for easier transfers. The sauna has a small one-inch lip, but that’s about the biggest access obstacle. Additionally there’s barrier-free access to the indoor and outdoor pools, with lift access to both. There’s also level access to Sinclair’s restaurant, which is located just off the atrium. Named after the former owner, this elegant eatery is the perfect place for a romantic dinner. And for a little stroll down memory lane, be sure and stop in at the old barber shop, which houses a small museum. There’s level access and plenty of room to check out the old barber chair and shoeshine stand, photos, china and lots of historic artifacts. And you might even learn a little about the lithium-filled water at French Lick — which was actually bottled and sold as Pluto Water well into the seventies. Also listed on the National Register of Historic Places, the French Lick Springs Hotel (888-936-9360, frenchlick.com/hotels/frenchlick) is a better choice for families. Although it exudes a certain elegance, it has more family dining options and a kid-friendly atmosphere. That said, the access at this property also shines. Although stairs lead up to the grand front entrance, an accessible entrance is located just to the left of the staircase. And if you tire easily, inquire at the bell stand about a free loaner wheelchair. 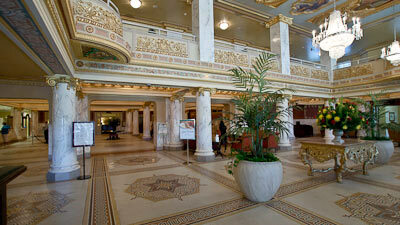 Although it’s completely different from the West Baden Springs Hotel, the front lobby is equally impressive. It’s hard to believe that the mosaic floor was covered with linoleum and the gold leaf wall embellishments were painted over, prior to the renovation. Today, it is returned to its former glory and quite frankly, it’s stunning. Linger a little before you check in, and enjoy the grandeur. 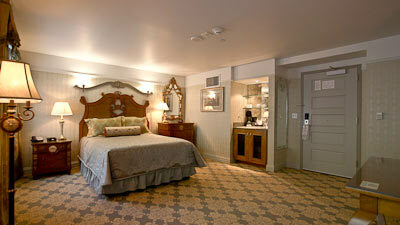 Accessible room 3308 features wide doorways and good pathway access around the 30-inch high queen-sized bed. The bathroom includes a roll-under sink, toilet grab bars on the right and back walls (as seated) and a low-step shower with grab bars, a hand-held showerhead and a fold-down shower bench. 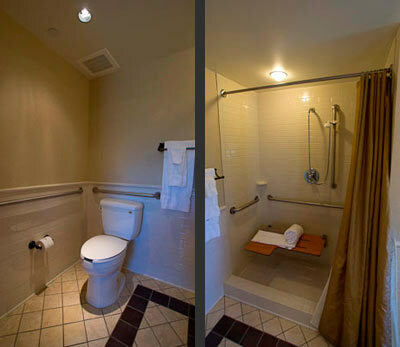 The shower bench configuration is the same as at the West Baden Springs Hotel, so again it’s possible to transfer without rolling into the shower. There’s also barrier-free access to the public areas including 1875: The Steakhouse, one of the more formal dining options. And if that’s not your cup of tea, there’s also several family restaurants, a pizzeria, a deli and even an ice cream parlor on the premises — all of which have good wheelchair access. Variety is the key word here in food choices, and I guarantee you won’t go away hungry. Additionally there is good wheelchair access to the adjacent shopping gallery and casino. And if you’d prefer to do nothing, you can always just kick back and relax on the very spacious front porch. Located about eight miles west of French Lick on Highway 150, Lark Valley Zip Line (812-295-9000, larkvalleyziplines.com) is also worth a stop if you fancy a little adventure. Attorney Matt Lark — who has a definite passion for zip lining — opened the facility this year, so he could share the sport with everyone. And so far, it’s been a rip-roaring success. Make no mistake about it, it’s not that this is a wheelchair-accessible zip line; however some wheelers may be able to give it a try because of Matt’s can-do attitude. The course has 11 lines, and guests are typically driven to the top, then they traverse down the lines, through the forest and across the river. Each line is different — some have stairs up to take-off platforms, while others are just dirt runways down to the river. That said, the last line, which travels 1000 feet over the river, is probably the tamest. Although it’s an adrenalin rush going over the river, the natural slope of the line slows you down for a very gentle landing on the ground. This is the most accessible line; and in fact it’s the one that has been done by a wheelchair-user. Granted there is no access to the take-off point, so she had to be carried uphill by two very strong men; but with a little adaptation and the willingness of Matt Lark, she was able to do it. It should be noted that advance reservations are a must, and Matt does ask people who need assistance to bring their own helpers. So, if you thought that a zip line was totally out of the question, think again. Give Matt a call and see if he can work out something to suit your needs. Again Matt gets top marks for attitude. Additionally he donates a portion of all his proceeds to Riley Hospital for Children at Indiana University. ‹ Are Airlines Required to Stow my Wheelchair in the Cabin? › Who is Responsible for Curbside Assistance?